BELOW THE DENSE JUNGLES of Belize’s Cayo District lies a complex web of underground tunnels, chambers, and rivers. 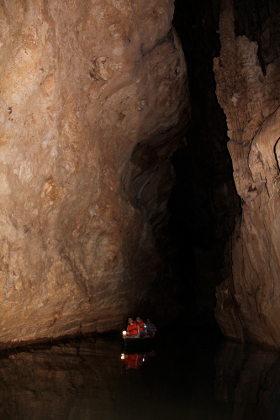 The subterranean landscape is easily accessible via caving trips. To the ancient Maya, these caves represented entrances to the underworld, Xibalba. Here, they communicated with the gods and performed sacred rituals — including human sacrifice. 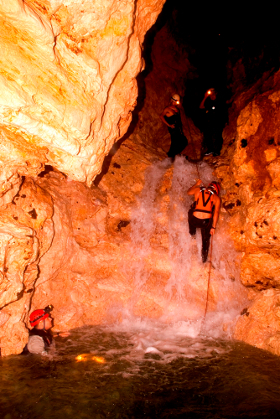 These are four of the best places to combine adventure and history in Cayo’s caves. A moderately challenging wet cave, ATM is one of the best-preserved underground archeological sites in Belize. There are over 1400 Mayan artifacts inside, mostly ceramic pottery, as well as the remains of 14 individuals. Among these is the crystallized skeleton of a young girl known as the Crystal Maiden, the only full skeleton of a Maya found inside a cave. The trip starts with a 45-minute hike through the jungle and three river crossings. Once underground, a further mile hike and a swim are required to reach the chamber known as the Cathedral, where all the remains are found. Located within Ian Anderson’s Caves Branch estate, buried hundreds of feet beneath the limestone mountain above, this river cave contains a total of six waterfalls up to 20 feet in height and beautiful crystal formations that surround an ancient Maya ceremonial chamber full of broken pottery. A three-kilometer hike through the jungle takes you to the cave mouth. Inside, you can climb up the waterfalls and either rappel or just bomb it back down. Awesome. Also in Caves Branch, Actun Loch Tunich is often referred to as the Black Hole, due to the 300ft sinkhole in the middle of the jungle that marks the cave’s entrance. To get inside, you rappel down into the black. The drop finally ends when you hit an underground river. Barton Creek is considerably mellower than the water flowing through the other caves on this list. Which means you can explore it by canoe. The still water and dripping cave walls give Barton Creek Cave an eerie feeling — you might say it belies the ancient Maya rituals and sacrificial ceremonies once performed here. The mile-long canoe trip passes skeletal remains and ceramics left behind by Belize’s historical inhabitants around 1300 years ago. You’ll paddle under natural stone bridges, 100ft open shafts, and other impressive rock formations.